The Desire Bulldog Sub-ohm Tank is the latest sub-ohm tank from popular manufacturer Desire. I’ve always liked their RDA’s, but this year they really came out strong with some good squonk mods, (Rage and Cut) a really good single 2×700 mod (Mad mod), a great RDA (Mad dog V2) and even a good sub-ohm tank (m-tank) so we’ll see if they can continue that trend with the Bulldog. 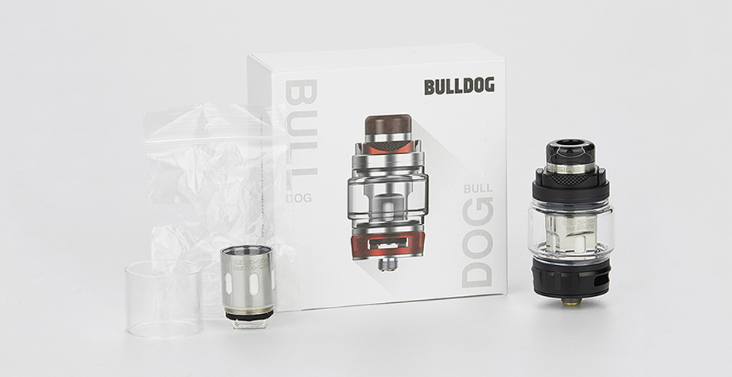 The Bulldog tank is a pretty standard sub-ohm tank that borrows some designs from their m-tank and of course, has a mesh coil option as well. The sub-ohm tank market is kind of dominated these days by Freemax and the Falcon so we’ll see if this one can stack up. It’s available in 5 colors; Black, Purple, Silver, Blue, and Red. The Desire Bulldog Sub-ohm Tank is a pretty standard looking sub-ohm tank. It’s smaller than a lot of other ones on the market though as it’s only 24.5mm and that’s rare to see these days from a 100+ watt tank. Many are going into the 25-28mm range now. It comes with a regular class for 3ml capacity and a bubble glass as well which gives it a 4.3ml capacity so good to have both options. Outside of that it’s a standard looking metal tank but has a nice color contrast design with anodized aluminum accents on the SS tank. I have the red one and it’s red and SS so gives it a unique look. They also include a resin dragon scale drip tip with a metal ring that looks great. Overall this type of tank is pretty popular these days so nothing stands out apart from the color contrast. They offer it in 5 colors so good variety and the red I have is quite nice, with a shiny finish on the SS but a more matte finish on the red parts. Overall I find it to be a nice but pretty common looking tank. 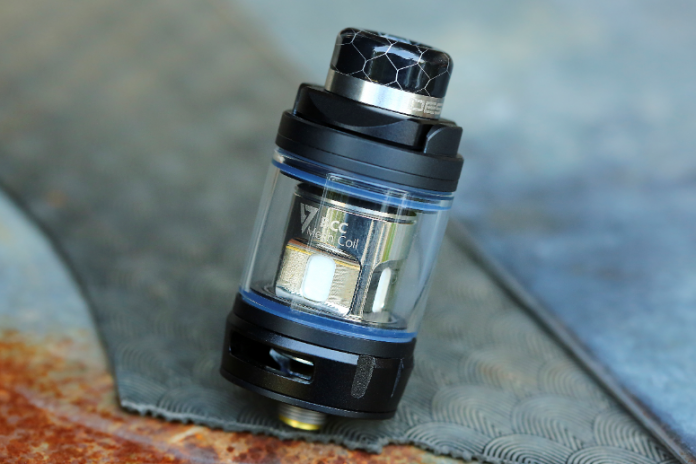 The Desire Bulldog Sub-ohm Tank uses a standard 810 drip tip so you can also use your own if you’d like but no 510 adapters to use a 510 drip tip as well. 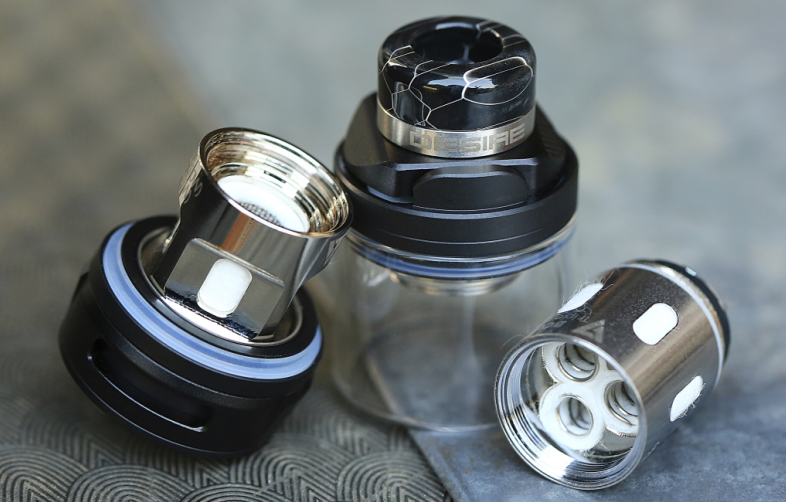 The drip tip does need to be an o-ring one as friction fit won’t work and takes the “TFV8” styled ones used on many tanks these days. The drip tip is a matching resin one so it’ll differ based on the color you choose. One thing to note is that there is a slightly raised area for the drip tip which is covered by the included one so will show with a different tip. Still, it looks quite nice with different tips too but I love the included one so no need to change it for me personally. The threading on this tank is excellent. It’s a very nicely built tank. The coil system is a screw in type much like most sub-ohm tanks on the market. You need the tank to be basically empty to swap the coils. The airflow is 2 large holes equally spaced apart on the bottom. It gets plenty of air, easily made for DTL vaping. The AFC is smooth and easy to adjust even on mod thanks to the nicely raised bumps and it’s on a stopper. The filling is easy as well. It uses the standard slide back top fill and it’s clearly marked with knurling on the push side and slides back easily and doesn’t protrude when shut so shouldn’t open in your pockets. It didn’t open when I used it. Like all these top fill designs, if using a large 100ml or more bottle you’ll want to remove the drip tip to make it easier. The 1 fill hole is a good size and easy to fill with any bottle type but you can’t just pour into it. 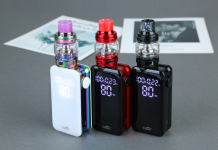 It comes with a standard 4.3ml capacity bubble tank and 1.3ml capacity standard tank. Now to the important stuff. How does it vape? There are 3 coil options in total and no RBA head. It only comes with 2 coil options which are the BBC triple coil and the BBC mesh coil. Both are KA1 (Kanthal) coils. I started with the .18 BBC Mesh coil and it was just ok. Pretty average for flavor for a mesh coil and good in the 65-75 watt range. The life was pretty bad though, I ran 30ml through it and it was pretty toast after that so average flavor but poor life. Then the BBC triple coil. I found it best at around 90-110 watts. Flavor again was not very good for such high watts and even worse it died after 22mls of juice. So below average flavor and poor life. Overall pretty disappointed in the performance of the coils, so not impressed and right now the market is saturated with good sub-ohm tanks so the coils are what really set them apart and this certainly does not. I am not impressed with this tank. It’s a pretty average tank that’s similar to a dozen others on the market. The 4.3ml capacity is good enough but only 3ml without the bubble glass and the issue with the coils. So with all that said, do I recommend the Desire Bulldog Sub-ohm Tank or not? I don’t like to do a hard yes or no, but I’m going to have to just say no here. Lots of good tanks on the market for this watt range and 3 stands out more than the others to me and this tank just didn’t have great flavor or great coil life so I can’t see a reason to recommend it.